STEVENS PASS — On the gray, rainy days that dominate the Seattle area this time of year, one of my few consolations is remembering that it means snow in the mountains. Snowshoeing amid white flakes is every bit as fun as hiking in the rain is not. Relatively warm winter days mean heading to higher elevations than usual. 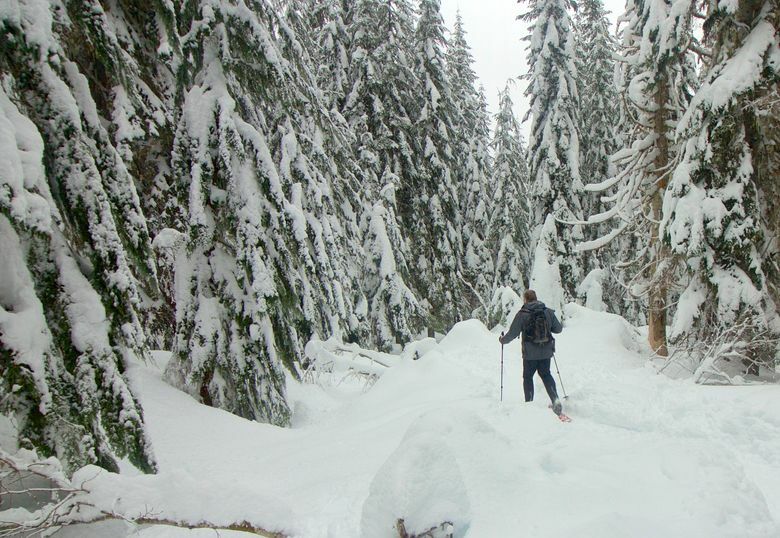 On a recent day when rain and temperatures in the high 30s were forecast for Snoqualmie Pass, I searched for snowshoeing options outside my usual winter day-trip zone. 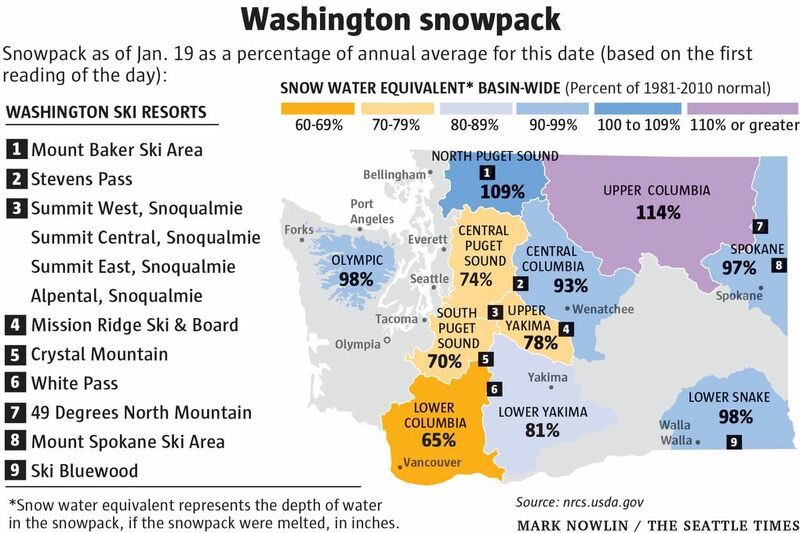 Seattle snow seekers have a few basic options for reliable white stuff: Mount Rainier, Stevens Pass, Mount Baker and the Olympics. Of those areas, Stevens Pass was the closest to me, and it’s an area I had never explored on snowshoes. 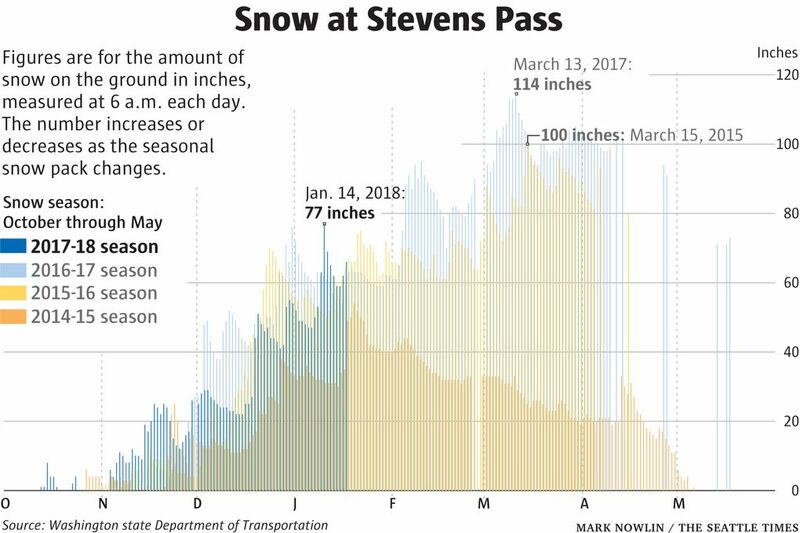 I chose a few options around the Stevens Pass ski resort, knowing access would be less of a problem than it could be for trailhead access that may or may not be clear. I was also in the mood for creature comforts in the form of easily available snacks and bathrooms. We headed for Lanham Lake, on a trail that starts from the Stevens Pass Nordic Center, about 5 miles east of the resort, and heads straight up a mountain. Or at least, that’s what it feels like. The trail gains 1,140 feet in its 1.6-mile climb to the lake — a fairly steep trail in any case, but it felt more so as we tried to kick-step into the crusty snow that lay under a steadily growing layer of fresh powder. I was grateful I’d consulted recent trip reports on the Washington Trails Association’s website, since route-finding was a bit tricky in spots. We also heeded the advice of the helpful volunteer posted where both the snowshoe and ski trails started: “Keep the stream on your left.” The snow quality improved as we gained elevation through thick forest; the trail leveled out for just a bit before a steep slog to the top. I realized, too late, that I’d forgotten to deploy the heel lifts on my snowshoes, which would have helped. Heel lifts were made for trails like these. Poles are also very helpful for steep, icy snowshoeing, especially for descents or small stream hops, of which there are a couple on this route. We encountered fellow snow lovers, including some practicing snowshoe techniques beside the trail. Many of the folks with dogs pulled their well-mannered pooches aside to prevent any tangles with our snowshoes (thank you, thoughtful dog owners!). We even saw some skiers, who impressed me with their ability to cruise up the steep slopes using climbing skins. Trail-etiquette tip for snowshoers: Give way to cross-country skiers, whatever kind of trail you’re on. As is the case in most of the Cascades, the mountains along Highway 2 are steep, which makes for challenging snowshoe terrain as well as avalanche danger. 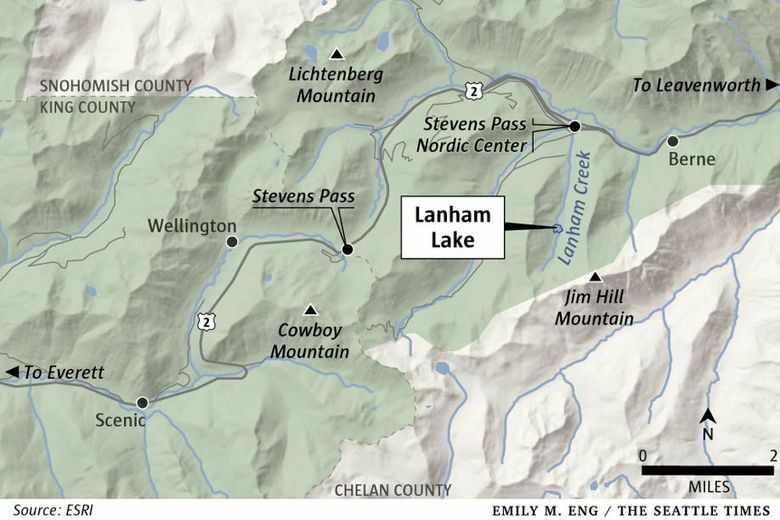 Although the Lanham Lake trail leaves from the Stevens Pass Nordic Center parking lot, it’s a backcountry trail with avalanche potential. Inexperienced snowshoers and those who aren’t sure about the day’s avalanche danger might want to try something on the tamer side. Fortunately, less challenging options are plentiful. Stevens Pass Nordic Center (stevenspass.com/site/mountain/nordic) features four well-marked interconnecting snowshoe trails of varying lengths and levels of difficulty. They range from the kid-friendly Hobo Hop, at .75 kilometers (or about half a mile; since this is also a Nordic skiing center, the distances are all in kilometers) to the Clickity Clack-Coal Burner combo, which heads from one loop into another for a total of about 4.5 miles. You do have to pay to use the Nordic Center trails ($13 for a day snowshoe pass; rent snowshoes on site for $15/half day or $25/full day), but parking is free, and you get the bonus of knowing someone else has done the work of figuring out how to keep you out of avalanche danger. And while many Cascades trails are uphill all the way out and downhill all the way back, these are gently undulating. “You’re off the couch, so to speak, and doing something relatively nonthreatening,” said Nordic Center manager Mike Power. Go far enough, and you’ll even reach a warming hut complete with hot beverages. Or just grab a snack at the Cascade Depot at the bottom. The trails sometimes intercept ski trails, so make sure you don’t disturb cross-country ski tracks. Other snowshoe options are nearby. 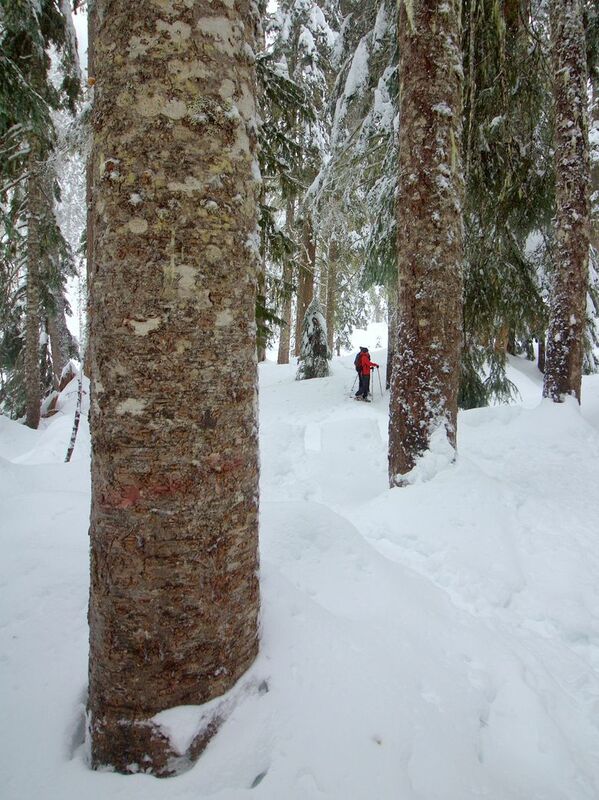 Lake Wenatchee Sno-Park features easy snowshoe trails. The longer but still moderate Nason Ridge trail leaves from there or the adjacent Nason Ridge Sno-Park. For a snowshoe outing with similar steepness to Lanham Lake, try Skyline Lake, on the north side of Highway 2. An early start is helpful on weekends, since the trailhead shares a parking lot with Stevens Pass ski resort. Be prepared for varying conditions: Wear layers (wool is my go-to fabric), and bring extra clothing in case yours gets soaked. Bring extra food and water, and always tell someone where you are going and when you plan to return. Washington Trails Association (wta.org) is a good source of recent trip reports, which typically include information on access roads, conditions and route-finding. Look for snowshoe-specific reports, since some hiking trails are inaccessible or dangerous in winter. Always check the day’s avalanche forecast at the Northwest Avalanche Center website: nwac.us. Also check the NWAC site for upcoming avalanche-awareness classes. Most recreation areas require either a Discover Pass (state parks and Sno-Parks) or a Northwest Forest Pass (national forest). Sno-Parks also require a separate Sno-Park permit. At 11 a.m. Saturdays and Sundays through March 25, learn about the winter environment, plants, wildlife, local history, and snow safety on a 90-120 minute, one-mile U.S. Forest Service-guided hike on snowshoes along the Pacific Crest Trail. Meet at the Forest Service Guard Station by Parking Lot A at the Stevens Pass ski area. Snowshoes provided. Reservations required; call Kevin Green with the Skykomish Ranger District at 360-677-2223. A $15 donation for adults and $10 donation for youth 16 and younger is suggested. More info at st.news/snowhikes. Sno-Parks are state-plowed parking areas at trailheads for snowshoers, skiers and/or snowmobilers. To find a site: parks.state.wa.us/303/Sno-Parks.